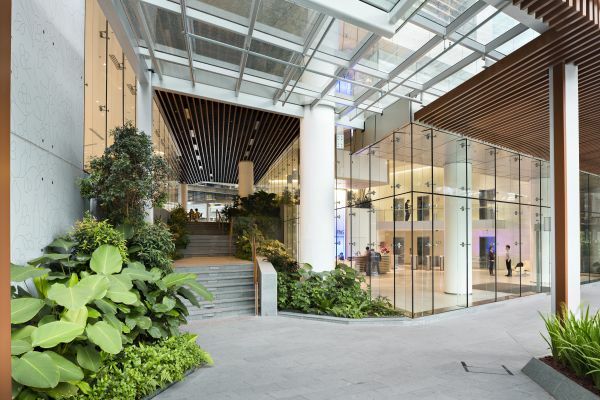 As researchers in Singapore settle into Procter & Gamble’s brand-new innovation center, SVR-ARCHITECTS celebrate quarter of a century of collaboration with the largest consumer goods company in the world. Time and again P&G have consulted SVR’s expertise: from planning regional headquarters to creating innovative laboratory designs and strategies for the digital workplace. Twenty-five years ago, in 1989, SVR received their first commission from Procter & Gamble for the Benelux Headquarters & European Technical Center. This office & research campus on the outskirts of Brussels remains one of the major hubs of P&G’s activities in the EMEA region. From the scale of site-wide master planning to detailed remodeling projects, SVR is still active on the campus today designing for ever-changing research objectives. In 2006 SVR started to expand their work beyond the Brussels campus, with the fit-out of the French Headquarters in Paris. P&G had recently acquired the Gillette and Wella brands and moved to a new building on the banks of the Seine. In total more than 15 000 m² of office space was created with over 800 work stations in only twelve months on site. As both consumer markets and pools of research talent continue to shift across the globe, SVR is helping P&G to create inspiring, new work places for R&D, first in Beijing, China and then in P&G’s major new innovation center in Singapore. The Beijing Innovation Center is a vast 22.500 m² including many technically challenging labs, pilot plants and offices for a wide variety of products from washing powder to toothpaste. Starting from a methodical lab programming process, SVR provides both conceptual and detailed design input to the local team of architects and engineers and conducts spot checks on site to ensure that the client’s expectations are met from design to completion. As the Beijing Innovation Center was being completed in 2009, P&G set out to design and build an even more ambitious R&D center that would become the reference for new facilities to come and home to around 500 researchers. In many ways this 154 million Euro, LEED Silver certified project is the culmination of current thinking in sustainable lab design, collaborative R&D environments and user engagement in the design process. The chosen location is Singapore’s Biopolis development, set among key public and private biomedical research institutes and organizations. P&G’s new innovation center is the largest privately owned household care R&D facility in Singapore and one of the largest of all research facilities in Singapore. The building’s dramatic shape is part of a master plan by the acclaimed architect Zaha Hadid, that reflects the morphology of natural formations, inducing cooling breezes, shade and public spaces that flow around and through the buildings. The building’s spectacular atrium and open atmosphere belie the technical complexity of the many specialized labs it contains. The key concept is connectivity: creating spaces that stimulate innovation through contact and sharing of ideas. Dealing with cutting edge research in a highly competitive market means that business objectives can and will change overnight. To cope with such a complex and volatile building program, SVR has developed tools to manage input from all the different stakeholders and developed a highly flexible, modular design concept. Fixed zones for all lab services, furniture and equipment facilitate both construction and changing requirements. The modular blocks of virtual laboratory space form the core of the R&D building. All research activities that do not require an expensive, controlled lab environment, take place in the open lab or office landscape right in front of the labs. Besides vastly reducing the required volume of air conditioning, this creates more opportunities for contact between the people and projects going on. Various collaboration and prototyping spaces form a transition & connection between the office and the lab space. The protective lab partition is as transparent as possible, lending not only visual communication, but also inspiring a sense of order and cleanliness: also essential to the quality of research. The open lab area is a hybrid concept in direct contact with the office space to promote interaction, while benefitting from the flexible service infrastructure of the lab zone. The role of SVR starts at the beginning of the design with a user engagement process designed to capture the detailed requirements, enhance users’ ownership of their new workplace and identify potential synergies. Capabilities that require similar processes, equipment or materials provide opportunities to share resources. Not only does this save space, reduce capital investment and maintenance: shared, open lab environments foster the vital exchange of ideas that research thrives on. Parallel to the project work, SVR has also contributed to the development of P&G’s Digital Workplace Design Strategy. The young talents that top companies are keen to attract, move swiftly between different cultures, work wherever and whenever it suits them with digital communication at their fingertips. A space model including a wide variety of workplace settings integrated with IT tools and Organizational Best Practices helps to create the inspirational environments where they can be most productive. SVR’s partnership with P&G has led to fruitful exchange of ideas with many internationally renowned design firms. Together we actively participate in a global Community of Practice. Today SVR continues to offer the full scope of architectural services at P&G’s Brussels Innovation Center and specialist R&D support for P&G worldwide. In Germany remodeling works have started on existing labs and a 3000 m² new extension building. In Japan, SVR is completing the conceptual design of lab space for the top floors of a new high-rise in downtown Kobe. Twenty-five years of work for a leading international company demonstrate SVR-ARCHITECT’s commitment to develop enduring partnerships, to look beyond each project at the wider cultural context and their clients’ long-term objectives.